According to Georges Bataille entropy is, by definition, excess energy; an overproduction. The current world is heavily investing in renewable energy due to new laws, potential carbon taxes, etc., in which energy technological efficiencies will grow exponentially coinciding with Moore’s Law. If people are unable to control this growing energy production, the future will face the same problem we do today, excess energy we call waste and therefore the ability to store energy efficiently is more critical than producing clean energy itself. Interestingly enough, Abu Dhabi finds itself at the center of this polemic being one of the worlds largest oil suppliers. This mass amount of stored energy has created a rapidly growing city and population that has produced excess tertiary space in its sprawl development. However, these spaces will eventually grow to the density of the city itself but it is uncertain the future energy that will facilitate such growth knowing that oil wells will inevitably run out. Many nations have been investing in their underground salt mines to store energy in the highly efficient form of compressed air. Why could not Abu Dhabi do the same with their oil wells, augmenting space devoid of its original use? 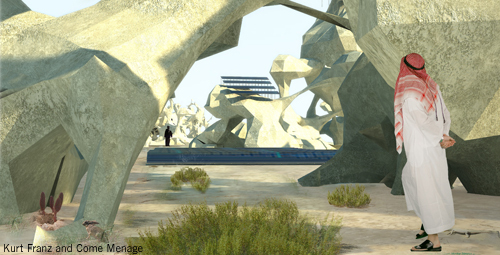 Sediment Spores puts into place a similar initiative by using devoid space and excess materials and matter from city growth to create bulbous caverns of compressed air energy storage/solar energy production land art piece on Site 3. 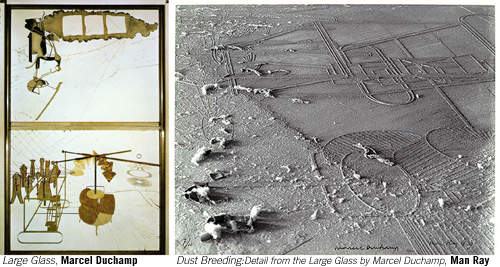 The interest of entropy, waste and excess was derived from the context of the site, energy production, and past land artists such as Robert Smithson and conceptual artist Marcel Duchamp. The site itself is a leftover space that is blocked from view by foliage. Such places are only noticed, or not noticed, once created. That is to say, “we only see the dust once it has settled.” The site is situated between 3 freeways near the airport and seemed to have the least value of the three sites thus proving the most potential. The project addresses the “structural blindness”, as Smithson puts it, of waste in the building process. 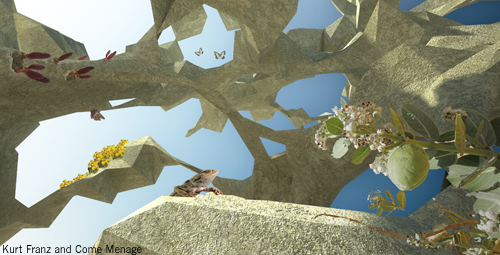 By using excavated soil from building(waste) as an instrument and a particular sand calcifying bacteria behavior as an architecture, the proposal intends to challenge viewers perception of how space in a rapidly growing city is created and understood by creating new material structures with waste by looking at systems of nature. This is not to battle entropy but on the contrary, to embrace it showing it’s repressed potentials in an urban context. The forms of the Sediment Spores are derived from the behaviors of its constructors. 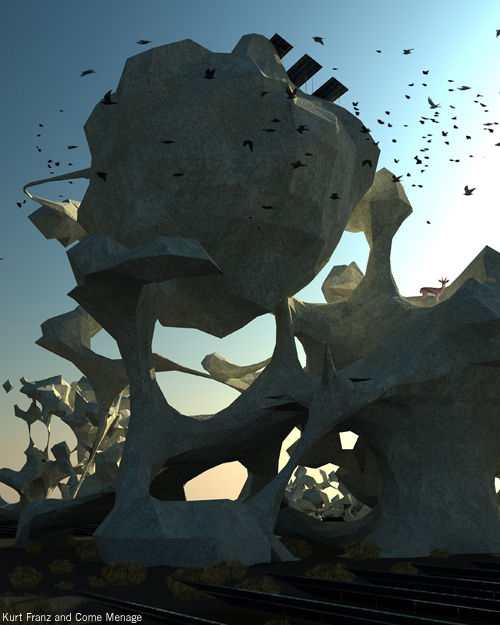 A study of Bacillus pasteurii movements and actions(a sand calcifying bacteria that is able to turn sand into solid stone in a 24 hour period) created emergent forms from our Java based 3D algorithmic visual script. The resulting forms are scaled up and placed onsite to accommodate the proper amount of energy storage to serve a large enough audience as well as the amount of incoming excavated building soil from development growth. Excavated soil from building development as well as the increase of sewage systems necessary both contribute to Sediment Spores production. By placing sand molds created from the emergent forms on Site 3, dumping excavated soil in them and adding calcifying bacteria with urine(urea is a key component of urine and is a key component in the bacteria’s calcifying process) the project parallels the process of Large Glass but on the scale of the city. When the city grows so does our project. 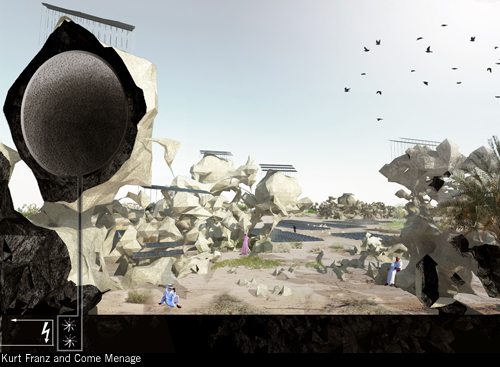 The resulting complex and organic patterning allows for multiple spatial features, incremental growth with the Abu Dhabi’s development, and different animal habitats which allowing for public viewing and interaction while performing as a solar energy harvesting and compressed air energy storage for thousands of homes.